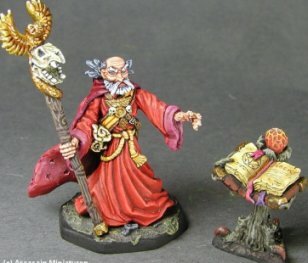 Colonel Marbles Miniatures Masterworks May 2003 !! 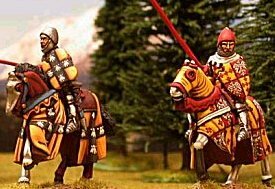 Mr Ed found these excellent pic's of some new Corvus Belli 100 Years War cavalry. 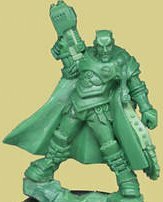 Excelsior have some new mini's for their Warzone & Chronopia ranges. Is this Renaissance swordsman for Chronopia? 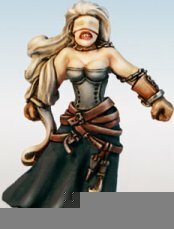 Somehow I can't picture that type of miniatures in the game's background. They would have looked better without the glossy paintjobs. 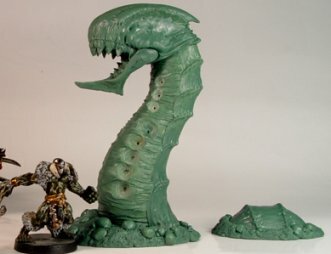 The Desert Crawler is not bad, but I never would have guessed it from the painted version... Reminds me somewhat of the Worms from Dune. I would have to say that this is rather disappointing. Look quite quite nice figs... but who the f*** painted them?? Those troopers look like christmas decorations! A new release from Crocodile. A beastmaster! 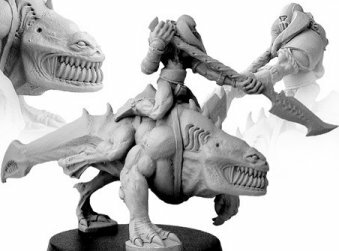 Good for Beastmen players too! Frother baz should be interested. Mutant-frother baz will be pleased. 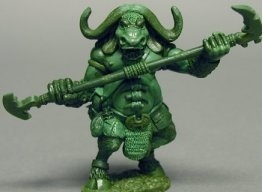 Don't really like the minotaur (does anyone remember when it was quite hard to get hold of larger beastmen figures?) but the fly demon is very nice. A right arse to paint though I'd think..? 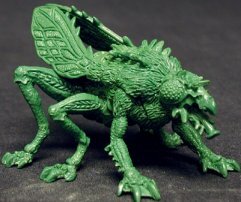 A camp minotaur, a dragon's head on the standard dungeon crawler body, biiiig fly and, ooh, a turtle monster! Some interesting stuff - Rob. Some very impressive scales being sculpted there. 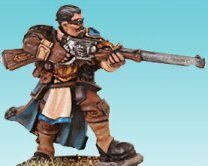 Here's a decent enough figure from Germany's Assassin Miniatures. Is it me or does his face look all squashed up? 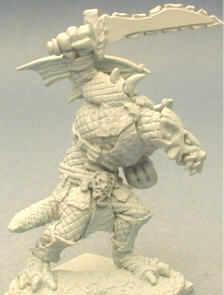 A great new fig from Rackham. Awesome fig! Both the rider and mount. One small qualm though, the rider just looks a bit too human. But great sculpt! I can see UnclEvl is going to have a bit of a shock when he sees that one! Very nice once again - just how to they remain so fresh in their approach? Aye, s'lookin' cool. 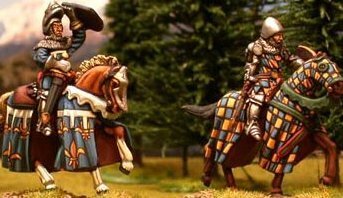 Thats 3 cool Cav they make now, so they keep going should have another regiment of heavy cav soon. 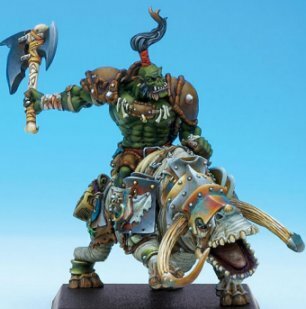 Personally though, I'm more interested in getting that boxed set of Orcs (Trackers?). They look wicked, esp. the Gobbo (?) with the shooter. 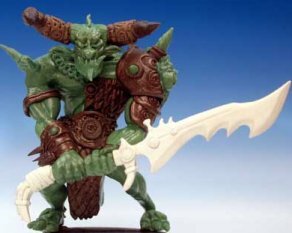 Still wanna get me mits on the Pirate Gobbos as well - no one had them at Salute and they've been out an age. 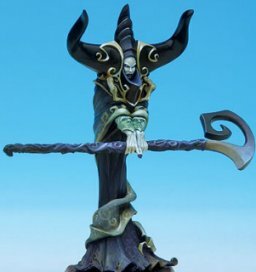 A new Dark Age figure - 'Shadowwalker'. Looking good. 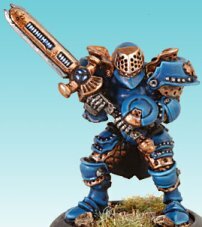 Would work well in a Chaos-inspired army too, I bet. Very nice once again. I don't care if its big, I can make up an excuse to use it!! 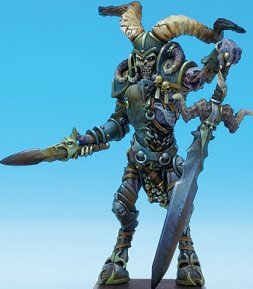 A couple of new figs from Warmachine. Nothing too special there - the sniper fig is cool enough I guess. Here's a couple of different limited editions that have been in my in tray for a few days. 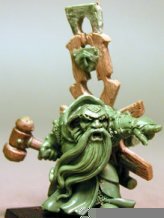 The new Foundry monthly promo Dwarf and a special Amazon release from the coolminiornot website, sculpted by Steve Buddle. Both of which will soon join the ranks of the WK hordes. That Steve Buddle green is rather good... might be a good champion for my new tribals army. Oh no what am I saying??? My wife is going to kill me!! The coolminiornot is a nice figure, at first I thought it was like the Celtos stuff but then I realised that this was because it was green..... it doesn't have an over-sized weapon etc etc. Well it is *quite* big. 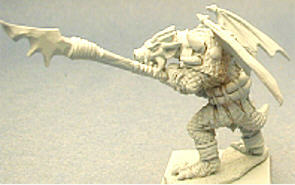 Two new Dark Age figures - the unpainted one is a limited edition. Once again great stuff from Dark Ages!! Good poses and original ideas. We really should try and actually play the game you know!! Doesn't do it for me. Sorry. 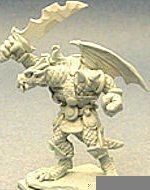 Not that they're bad sculpts, just a bit boring. 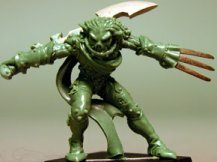 For more discussion on Dark Age mini's and Brom's art, see this revealing messageboard debate. Orc Warlord looks cool, although almost looks beastmanish from this shot. Especially interested by the Half-Orc assassin though. Cool fig and don't believe I've seen any of their Half Orcs before. Must check to see what the range is like. Gotta agree about the warlord there, its a funny old orc. 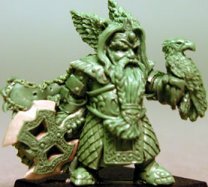 Dwarf priest is pretty cool, lovely dynamic fig even if the back attachment is a bit daft. 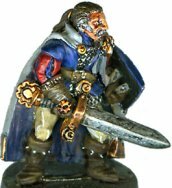 Dwarf King is a bit disappointing though. Very dull fig. A rather funky limited edition figure that's available to people who attend Bayou Wars (thanks to Jason for the correct info on that!). 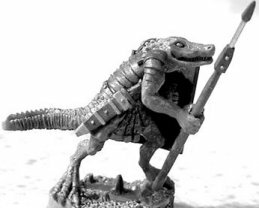 Wasn't the Dead Deputy looking for crocodilian lizardmen? I'm a little underwhelmed this time. Nothing wrong with it, just doesn't have any surprises. 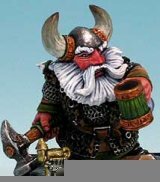 Some nice Dwarf figures out lately - this is new from Freebooter . Cool weird beasties. That mount seems to be kinda double ended. Much better than the previous models, especially the creatures. Like the demon but I think the others are pretty mediocre really. Suppose the angel is good if you like that sort of thing, and fits the setting well I spose (I have a tendency to view 1999 figs as 'general sci-fi' rather than being specific to the setting so maybe they they suffer from that... then again a cool fig is a cool fig so maybe not). Not too impressive, except perhaps for the big guy with no eyes. 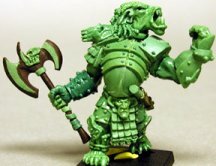 A very nice Beastman green, again from I-Kore Celtos. Looks very kinda 'Fomorian'. Is that on purpose to fit with the Celtos range mebbe? Ahhhh! 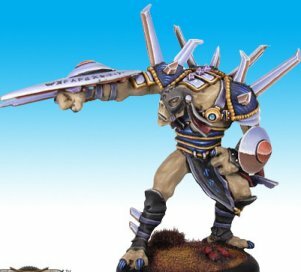 When the Col. posted it on the mailing list he just put it up as 'Beastman', and I said at the time I thought it had something of the Fomorian' about it and wondered if it was to fit in with the Celtos stuff. 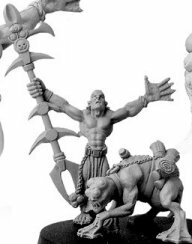 Now I know it is a 'Fomorian Beastman' all becomes apparant and I think the emphasis should be on Fomorian (Sea Devil) rather than Beastman. Given that, have to say its doing the job for me. A great Succubus from sculpter Steve Buddle. His stuff is really good. Can't wait to see how this one casts up. I want that! Where are all these figs being sold eh? Roll on the launch of "Buddle Enterprises" says I.
I like the feet too, he's avoided the temptation to make the fig just a naked bird with wings and a tail. Yes indeed - great work as always! These flying-lizard type things are from Alternative Armies . Must be the first time Alternative Armies made it into the Masterworks. These aren't bad, given their usual standard. Dats some hat on da broad. 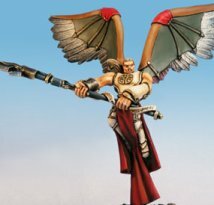 Reminds me of GW's last Chaos Dwarf releases #hawk, sput#. Not too clever really. The other big fellah's ace though, no more need be said really. I like them both (ok the hat is kinda of silly). Wolfen looks lethal. 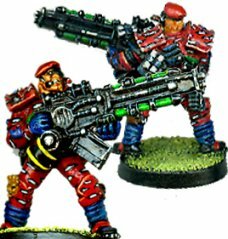 Paintjob on both is superb. The hat on the Witch/Sorceress is a bit odd...? The other fig (Wolfen? 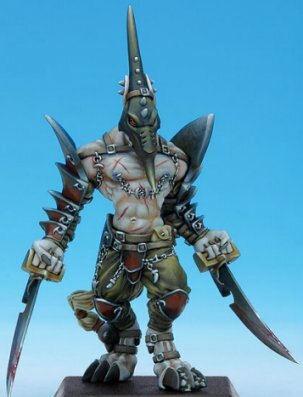 --might be from that new Devourer line, Hyena's I think they are--could be wrong) - now he looks "ded 'ard!" 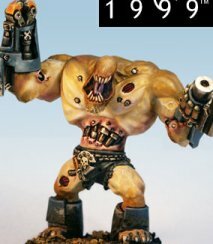 as the Orks say! All of the above comments. Umm, how many of you anti-hatters have said anything about Rackham weapons? Indeed, this weapon? Love the first figure, don't like the second. Not my thing. Then as I looked I discovered the scars! Would that explain things? The Sorcerress looks very anime/manga. I like it. 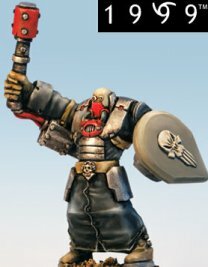 Hmm, anyone know if the scars on the Wolfen are sculpted on or painted on? Either way it looks well mean!